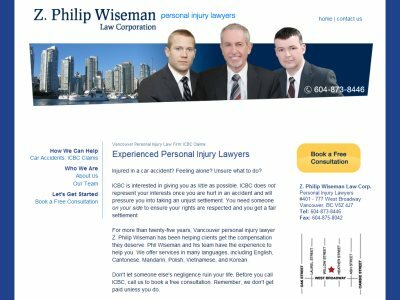 Z. Philip Wiseman Law Corporation is a personal injury law firm in Vancouver, British Columbia. Practice Areas: Car Accidents, Motor Vehicle Accidents, ICBC Claims. Languages: English, Cantonese, Mandarin, Polish, Vietnamese, and Korean.